From the lagoon you can go left or right as you look at the ocean. Left offers a longer option, which will eventually take you to Cannonvale Beach via Abell Point Marina and Shingley Beach. Cannonvale Beach is 3.25km from the lagoon; it's a very easy and predominantly level walk with spectacular views of the ocean and a few lovely places to stop and grab a coffee along the way, including Sorrento’s and the Fat Frog Café located on Cannonvale Beach. On any of the foreshore walks, your distance travelled is marked every 250m by a timber post on the side of the walk. This is also very handy for those who enjoy jogging. Be sure to stop at the beautiful Shingley Beach. With picnic tables, barbecues and amenities, it is the perfect place to have a picnic and watch the local outrigger club on their daily practice. Here you can also hire stand-up paddle boards, kayaks or book a lesson for the beginners (as you can at the beach on the western side of the lagoon, with Whitsunday Stand Up Paddle and Kayak ph 0404 463 188). As you continue toward Cannonvale you will pass two large complexes. The one on the right, Peninsula, was developed by Kevin Seymour, one of Queensland's richest men and largest private developers. There are 42 apartments and 41 of them sold within the first three months of being released to the market. This set a record at the time, with the average price achieved being $1,400,000. 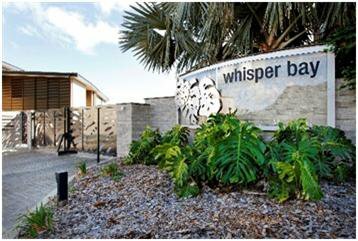 The next development is Whisper Bay, rumoured to have cost $160 million which caused the developer to fall into receivership. All 104 apartments were then sold to a developer for $56 million and the apartments are now selling for less than half their original price. This is the development that Bob Hawke and Andrew Johns were rumoured to have bought into, first time around. It was purchased from the receivers by David Marriner and a Chinese company - Full Share (Australia) Management Pty Ltd, and is now totally owned by Full Share. Their local interest also includes Hook Island Resort, Laguna Quays Resort and Island Air. David is an experienced Melbourne developer, owning four theatres (including Melbourneâ€™s Princess and Regent Theatres) and also the Sheraton Mirage in Port Douglas. The Boardwalk also continues on the right side of the lagoon, meandering along the beach front, through to the Saturday Markets and the Whitsunday Sailing Club. Continuing along from there, you will come to the Beacons – the New Beach in Airlie, along with some of the best houses in Airlie Beach. The Beacons is part of the Port of Airlie Development, more of which continues along the boardwalk and through the Marina until you get to the Whitsunday Cruises Terminal. Further on from this will bring you out to Jubilee Pocket. The Whitsunday Great Walk is one of Queensland's eight Great Walks. It has something for everyone and can either be accessed from Airlie Beach or Brandy Creek. 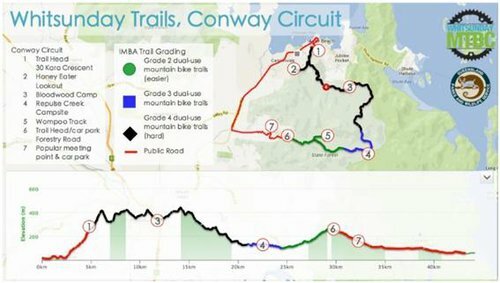 The walk winds through 22,000 hectares of the Conway National Park and is truly spectacular. If you intend to do the entire walk, which is technically a three-day walk, I would recommend starting from the Brandy Creek end, as the gradient seems to be a little easier, having done it from both ways myself. Many have strolled the walk in a day so don't feel like you necessarily have to set aside three days of your holiday unless you truly wish to fully experience it in all its wonder. Should you decide to take your time, there are three camp grounds along the way and some rainwater tanks for water. I have run through quite a few times and a number of friends have walked it in about seven hours. It is very undulating and can be hard work. However, I can assure you, it is very rewarding! The entire walk is 27km and each kilometre is marked so you can gauge where you are. Leaving from the Brandy Creek end, the first eight kilometres are all primarily downhill; however, don't be fooled as you will find your way to the hills. It is safe but I wouldn't recommend going by yourself due to the carpet snakes (pythons) which you may come across on the track having a sunbathe. You may also see the odd wild pig but just observe and you will be fine. I think that if this is as dangerous as it gets, we live in a pretty wonderful place. If you're not prepared to invest that amount of time, you can still experience the National Park with shorter walks on this stretch. 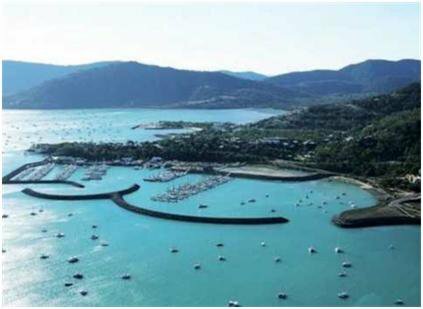 From the Airlie Beach (access off Kara Crescent) there is an 8.2km round trip called the Honeyeater Walk, which takes you to a lookout over Pioneer Bay that has to be seen to be believed. This 850 metre Airlie Creek Track slowly winds up the hill behind Airlie Beach along a gravel path, featuring rare flora and fauna such as the Whitsunday Bottle Tree and the endangered Proserpine Rock Wallaby which are only found in this region. The track winds you through tranquil forest which is home to magnificent fig trees, sub tropical plants, beautiful native birds and ends up at scenic natural rock pools. 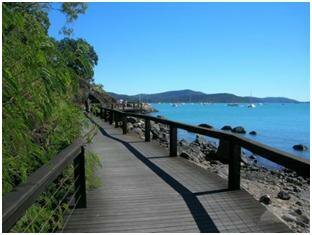 The walk back offers views of the beautiful blue Coral Sea and Whitsunday Islands with leafy frames. Walking time: allow one hour. Access: from Waterson Way, Airlie Beach. The Brandy Creek start of the walk has two shorter walks (or you can simply walk in as far as you choose and turn around). The first and shortest of these two is Kingfisher, a 2km walk through spectacular rainforest which really is a must. The rainforest is dense, hence the walk is cool and inviting. From this end, you find the first creek, which is usually flowing, just after the 4km mark and the first campsite, Repulse, at the 8km mark. Mobile phone service is patchy at best through the walk so ensure you are prepared and someone knows where you are. There are several other mainland National Park walks. As you drive to Shute Harbour, the National Parks office is located on the corner of Shute Harbour Road and Mandalay Road and they are a really helpful group. Just a couple of kilometres past the office on the right is a park and picnic area and there are a couple of short 30-minute easy walks from here. These walks are full of wildlife and we often see wild pigs and piglets on this walk. Further toward Shute Harbour, you will see the parking for Mount Roper and Coral Beach walks. Both of these walks are a little more testing, however both are easily achievable. It's likely you will be the only person at Coral Beach, which is a lovely feeling. I recommend allowing a couple of hours return for each of these. When you get to Shute Harbour petrol station, take the left turn and drive to the top of the hill where there is another park for walks. However, on the way up, stop at the lookout. It has magnificent views over Shute Harbour. There is a walk to Cane Cutters Beach, which is one of the area's best beaches in my opinion, particularly when you take into account its close proximity to Shute Harbour. The beach is called Cane Cutters because the local cane farmers over the years have camped there and built a number of huts just above the high tide mark. Again, this beach has ample shade, particularly in the afternoon as it is east-facing. If approaching by boat, it is best at mid to high tide as there is a fringing reef a couple of hundred metres out. We have spent lots of weekends and weeks camping here and it has a special place in our lives. The northern headland has a light marker and is called ‘The Beak’, and if you have a chance there is great snorkelling and spear fishing here. We have enjoyed many crayfish and coral trout from this very spot.